This hike begins off Forest Road #2329-083, which is just off FR #2329. The trail begins in a large parking area at Muddy Meadows. The trail is heavily used by horses but motorized vehicles are prohibited. In season this hike is very floral. And in season it can be very muddy... thus the name. Oh, before I forget, in season you can be considered dinner by the local wildlife.... MOSQUITOS!!! Now, back to the hike. The trail climbs gently across Muddy Meadows and at about a mile it begins to show evidence of a little more steepness. The hike never gets really steep, but always gains elevation on its way to Foggy Flats. Much of the first 3 miles of the hike is in heavily forested areas. At about 2.7 miles the trail crosses the Pacific Crest Trail #2000. After that junction the trail becomes less used, but never hard to follow. The wildflowers become more common as the trail enters more open areas. You will hike beside a sizeable creek along this part of the trail. At 4 miles the trail connects with High Line Trail #114. 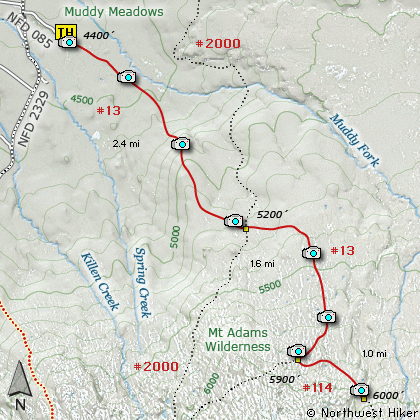 Take the left option and follow Trail #114 to open flat areas referred to as Foggy Flats. The day I hiked this trail it was very foggy at Foggy Flats. However, the clouds did part for just a moment allowing me an opportunity to get a few great shots of Mt Adams which are included in this program. From Portland, travel east on Interstate Hwy 84 to Exit 64 at Hood River. Turn left, and pass under the freeway and cross the toll bridge ($2.00) into Washington state. Turn left onto SR14 and drive approximately 1.5 miles to state road 141 Alt. Turn right onto SR141 Alt. and follow it another 2 miles and merge bearing left onto SR141. Then travel north on SR141 for another 19 miles to Trout Lake and the junction to Mt. Adams Road. Bear right and forward onto Mt. Adams Road for about 1.3 miles and you come to the junction with Forest Road 23. Bear left and ahead onto FR23 and continue north for about 19 miles and you will come to the junction with Forest Road 90. Take a sharp right uphill turn and continue on FR23. At this point the road becomes very rough surface and you will follow this road for just under 3 miles. You then come to the junction of Forest Road 2334. Bear right and continue on FR23 for another 1.4 miles. You will then come to the junction with Forest Road 2329. Bear right and straight ahead onto FR2329. FR2329 is paved for the next mile, but don't get used to it. It turns to gravel again for the remainder of the journey. After leaving FR23 you will travel about 5.8 miles and come to the trailhead for Killen Creek on your right. 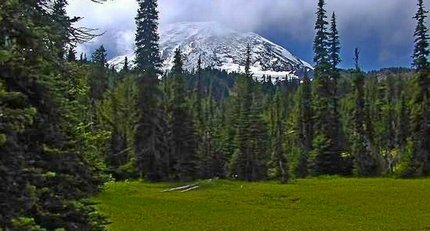 But for this hike, you continue another 1.7 miles to the road on your right that takes you to Muddy Meadows, which is where the trailhead for Foggy Flats is located.